The news and reflections of a health visitor. What Health Visitor’s do… the basics. “But what do they do?” “So you’re not a nurse anymore?” and “Why?” were the most common things that even my husband asked when, after over 10yrs working in Children’s A&E I decided to switch to health visiting. I’d returned to A&E after having my daughter, but things didn’t feel the same and I knew I needed a new challenge. I didn’t feel like I’d had the best experience with health visitors and had felt that I could do the job better than I’d experienced. Nearly halfway through my two years of part time study I still feel it’s the right path for me and I hope that I can explain what we do. Health visitors are nurses or midwives who have undertaken a further degree or post graduate diploma to become community public health nurses – school nurses have the same qualification. In recent years, after over a decade of dwindling numbers and a lack of concern regarding its fate, research started to highlight the importance of children’s early years and how for a number of families small interventions can help prevent huge problems in later years. To borrow an analogy (thanks David Munday! ), having been fishing people out of the river we’re trying to man the gap further upstream to stop them falling in. Personally I see our role as a continuation of the care started by midwives – very few people would anticipate going through pregnancy without a midwives support, and so it would be strange not to continue some support and guidance with families once the baby arrives. The “Call to Action” in 2011 set out the Government’s plan to invest and aim to raise HV numbers. Over 4,000 new health visitors have been trained in the last 5 years, and while many more are still needed to enable us to reach the level of service we want to be able to provide, it’s a start. Our overall aim is to ensure that all children and families, no matter their circumstance, are able to reach their full social and health potential. While there is still some variation between regions, the 4,5,6 model (as first described by Viv Bennett) showing the 4 different levels of care we offer, 5 key contacts offered to all families, and 6 key public health issues which we aim to improve outcomes in. The majority of families are offered universal service – their offered the five visits (similarly to how antenatal contacts are planned with midwives) and have access weekly to Well Baby/Child Health clinics manned by health visitors, staff nurses or nursery nurses and support staff as well as having contact details for their health visitor/their team to use if ever needed. Support is offered to all families with children up to school age. Additional contacts typically offered would be a visit if you moved, from your new HV to welcome you to the area or to ensure all’s well after a child’s A&E attendance or admission to hospital. Universal Plus would be where an additional service (for example, speech therapy or input for a long term health issue) works with a family and likely have extra contact with a health visitor. Universal Partnership Plus is offered to the small number of families where several different health and social care agencies work together to help them. These families although the smallest proportion of a caseload, require a great deal of time and attention from health visitors due to the complexities of their situation. While still being established in many areas, the antenatal contact is vitally important to give health visitor’s chance to meet and chat with parents and begin to ease their transition into parenthood, ensure education and support with breastfeeding (or that the best advice is given for alternate feeding) and start the relationship with a family which will last for 5 years or more and aim to work with the families to ensure they reach their full potential. 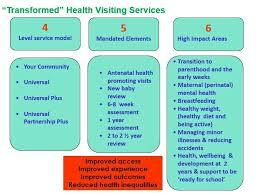 The 6 high impact areas are taken from the Healthy Child Programme. It’s this long term relationship (so different to the 4hrs I’d get in A&E!) and the chance to use my knowledge and skills to really make an impact and difference to families that really appealed and is what gives health visitors the drive to continue and tackle the adversities that communities, families and themselves face.